Sunnysyrup Food Co., Ltd. was established as Taiwan Popping Boba Passion Fruit manufacturer and supplier, Our factory incorporates the very latest in hi-tech machinery and testing equipment. We continues to improve on product quality and assure that each product exceeds the performance and reliability standards expected by customers worldwide. Customers are assured of receiving the most innovative and highest quality professional products. Please do not hesitance to contact us now. with bright and smooth surface. When biting the boba, passion fruit juice is flowing out into your mouth.Sweet passion fruit juice makes various kinds of tea appreciation. Regardless of extract tea or fruity tea, adding Popping Boba-Passion Fruit Flavor Coating Juice could be perfect fusion. lifting the spirtis and with lasting aftertaste. 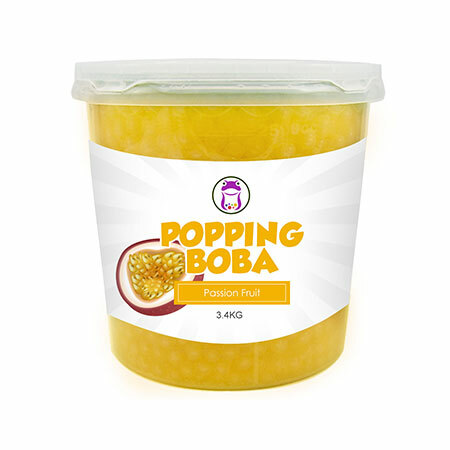 Popping Boba-Passion Fruit Flavor Coating Juice is made of Pasion Fruit Conc. Juice, suitable for various of drinks and as topping for frozen yogurt.